As chair of the coordinating committee of the International Union League for Brand Responsibility, I am thrilled to take this moment to share some important updates with our friends and allies. In the past three months, your moral and economic support has strengthened garment workers across the globe as we launch an effort without precedent and that we believe is our best hope for ending sweatshop exploitation. We hope to provide an update to you quarterly, along with occasional urgent news and requests for action. Please do not hesitate to contact our coordinating committee at organize@adidasworkers.org. Launch of the League and our First Campaign, Adidas Workers Unite! On February 10, after one year and three months of meetings and planning over internet conference calls, our union organizations from eight countries in Asia and Latin America announced the formation of the International Union League for Brand Responsibility, and our first campaign, Adidas Workers Unite! Please read and share our declaration released that day, available at http://adidasworkers.org in various languages. On that day, I traveled to New York City with other League representatives from Indonesia and Honduras to join our allies United Students Against Sweatshops (USAS) and other union activists to confront Adidas at its Fashion Week events. USAS activists even managed to personally confront famous singer and Adidas spokesperson Selena Gomez: http://bit.ly/14xdfvU In March, along with Indonesia League representatives Heni Sutisna and Aslam Hidayat, I received an enthusiastic welcome as we announced our efforts at the convention of Workers United, the descendent of the U.S. International Ladies' Garment Workers' Union from whose historic struggles and successes we draw much inspiration. Take a look at articles about the launch in the U.K. Ceasefire magazine, U.S. Counterpunch magazine, and put in context in an op-ed by Penn State Prof. Mark Anner. League Welcomes Workers’ Unions from Across the Globe. Since the year began, the League has officially voted in four new members. They are each militant, democratic, fighting union organizations from critical countries in the supply chain of Adidas and other multinational brands: C.CAWDU in Cambodia, GATWU in India, BIGUF in Bangladesh, and the committee of ex-workers of PT Kizone in Indonesia. Two additional union organizations that have requested membership are in the final stage of the League’s evaluation process, one in South America and the other in the Middle East. 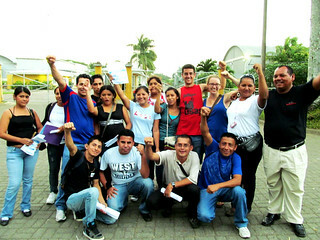 Violence and Repression by Nicaraguan Employers and their Bureaucrat Allies. A week after we announced the League and its Adidas campaign, our member in Nicaragua came under serious threats that led to violence. 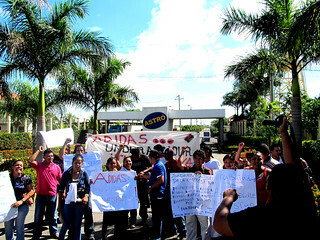 On February 18, leaders of the Sandinista-aligned Union Federation of Maquila and Textile Workers (FESTMIT), were told by a top bureaucrat of the government’s free trade zone agency (CNZF), Emilio Noguera, that “we will not allow” the Adidas campaign, threatening the unionists would be held responsible for scaring away investment from multinationals. The threats escalated through March 4, when a violent mob paid by Korean manufacturer SAE-A beat up FESTMIT activists at a peaceful demonstration outside the Tipitapa free trade zone. Immediately after, CZNF director Alfredo Coronel, arrived and told FESTMIT’s Secretary General “you are going to repent” and called him a “traitor.” In August of last year, representatives of CNZF “ordered” FESTMIT to withdraw from its campaign to organize workers of Gildan Activewear, and unionists received threatening anonymous calls and were followed home by a SUV with darkened windows. Soon after, top CNZF official Enrique Espinoza became Viceminister of Labor and has shamelessly demanded unionists be “flexible” when employers violate workers’ rights. Corrupt so-called union leaders, likely paid off by the employers, joined the attack with a March 14 press conference declaring absurd and vicious propaganda against the League and some of its international allies. None of this has deterred FESTMIT from continuing to organize workers and demand justice -- as the Nicaraguan slogan says, ni un paso atrás! League representatives have communicated directly with President Daniel Ortega to request he meet with us and intervene in these bureaucrats' unacceptable attacks on our sisters and brothers in Nicaragua. Worldwide, the League’s unions are no stranger to these sorts of threats and violence -- C.CAWDU activists are currently fighting back against a violent mob attack at E Garment in Cambodia, and GATWU activists were recently confronted by thugs and a manager of Arvind Lifestyles. Nonstop Illegal Union-Busting Firings at Adidas Suppliers. Virtually every time Adidas workers form a union to truly defend their rights, the union leaders are illegally fired. Most recently, at Adidas supplier Joe-Anne Dominicana in the Dominican Republic, workers were fired en masse after holding a meeting to form a union. The same happened when workers formed unions at Adidas suppliers Pinehurst Manufacturing in Honduras and at both Flying Needle and Troon Manufacturing in Nicaragua, and the workers were only rehired after intense pressure and damning investigations by the Worker Rights Consortium. At Troon, bosses continue to fire workers for simply speaking with union leaders. 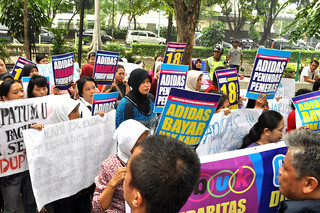 Illegal anti-union firings has proven to be a systematic practice in Adidas' supply chain. But direct solidarity between Adidas workers across factories and across borders is a new ingredient -- Adidas was surprised when workers at Troon and Pinehurst supported the fired unionists of Flying Needle. PT Kizone Ex-Workers Refuse to Back Down. Thank you for standing with workers as we begin this new phase of our struggle with multinational apparel brands. We ask you to encourage your family and friends to contribute at http://union-league.org/donate. As women and men working in the maquilas we will be grateful for your support. ¡Sólo el pueblo salva al pueblo! Only the people can save the people.